There’s nothing secret about the Secret Pond restoration project at Nakoma Road and Manitou Way. Any time trees fall and bulldozers roll at the University of Wisconsin–Madison Arboretum, people take notice. But when it comes to earth moved by machine versus earth moved by stormwater, the only difference may be runoff’s penchant for working under the radar. 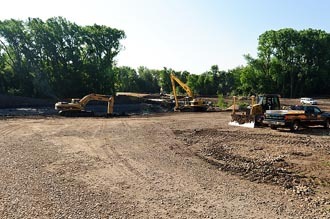 Construction has begun on a new retention pond inside the UW–Madison Arboretum designed to protect Lake Wingra and the surrounding area from stormwater runoff. The Secret Pond restoration project is located near the intersection of Nakoma Road and Manitou Way. About 167 million gallons of water enter the northwest corner of the Arboretum and Lake Wingra every year at Manitou Way. It’s the largest drainage into Lake Wingra, collecting water from a swath of Madison’s west side stretching west past Whitney Way roughly between Odana Road to the north and the Beltline highway to the south. All that water carries tens of thousands of pounds of sediment, choking wetlands and filling the very ponds meant to trap silt. The Secret Pond restoration is aimed at patching the last line of defense the Arboretum has against the flood. “It’s part of a series of stormwater projects that mitigate the effects of water, silt and invasive species that could be carried into the Arboretum with runoff,” says Kevin McSweeney, Arboretum director. According to David S. Liebl, a UW–Madison Department of Engineering Professional Development faculty associate who chairs the Arboretum stormwater committee, several decades of runoff had ended the useful life of a pond built in 1985. Sampling revealed about 60 feet of peat muck under the old pond, a poor base for re-construction. “To re-build the old pond would have been incredibly expensive and incredibly disruptive to the environment in the wetlands,” Liebl said. Planning shifted closer to the Manitou-Nakoma intersection, which was covered in a trio of invasive plants — dame’s rocket, garlic mustard and Japanese knotweed — and where crews have begun carving out a new, larger sediment-trapping pond. Valuable trees and shrubs like viburnums were moved from the site under the guidance of Ed Hasselkus, emeritus horticulture professor, to new homes that include an area just east of the restoration project. A new fieldstone-lined creek bed flanked by wide swales of sedge and other native wetland plants will carry water from the pond into the wetlands. And the works, which will be covered, planted and seeded by the end of September, should last far longer than the ’80s-vintage pond it replaced. “This one is engineered so it can be cleaned out as it fills without needing to be completely rebuilt,” Liebl says. Avoiding future construction is a plus, since even “built” landscapes quickly take root in the hearts of neighbors, passers-by and frequent Arboretum visitors. The project at Manitou Way follows less-visible work on ponds near Todd Drive, Fish Hatchery Road and Ho-Nee-Um Pond not far from the Secret Pond site. Next up, Liebl says, is likely remedial work around Curtis Pond. Planning for that project should be finished this year.